Be: Slim with the hummel Slimmer Stadil Low Retro trainer! Based on a classic 80's heritage trainer the hummel Slimmer Stadil Low Retro has been updated on a new slimmer silhouette. Featuring a low profile fullgrain perforated leather upper on a Vulcanised sole unit this is football fashion at its very best! Value for money, strong seasonal colours and staying true to their heritage is the key to hummel's brand ambition. 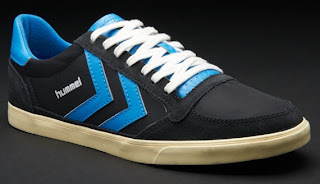 As one of the oldest teamsport brands in the world hummel has demonstrated unique authenticity, adaptability and character since 1923 when it was formed by the Messmer family in Hamburg, Germany. Ever since that year almost a century ago, sports have been the core of hummel. 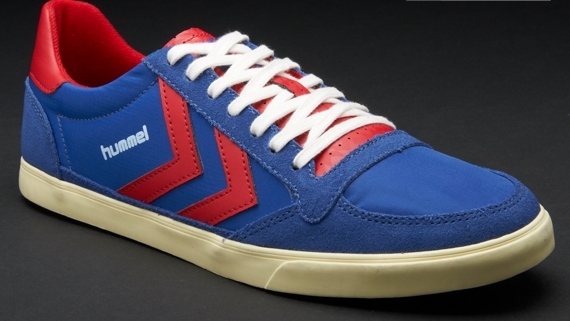 In the 1970's hummel ( now based in Denmark ) found fame with sports inspired fashion ranges and other sports apparel bearing the distinctive chevron pattern. With the fashion worlds passion for retro inspired sportswear hummel is a now a key brand on the street as well as being seen on such celebrities as Alex Turner, Black Eyed Peas and Justin Timberlake .